Key difference: The Alcatel One Touch Idol is the official mobile partner for the movie Iron Man 3. It features a 4.7 inch IPS LCD capacitive touchscreen with 16 million colors. The display has a resolution of 540 x 960 pixels. The phone is powered by a Dual-core 1 GHz MediaTek MTK 6577+ and a 512 MB of RAM.The Micromax A116 Canvas HD is the successor to the really popular Micromax A110 Canvas 2 and is better than its predecessor in every way. It features a 5.0 inch display with a resolution of 720 x 1280 pixels. It runs on a Quad-core 1.2 GHz Cortex-A7 and 1 GB of RAM. Alcatel-Lucent is a global telecommunications equipment company based in Paris, France. It is best known for providing telecommunications solutions to service providers, enterprises, and governments around the world. In addition, they also focus on fixed phones, mobile phones, converged networking hardware, IP technologies, software, and services. Among its many series of phones, one is the Alcatel One Touch, which is an Android based smartphone series. Some of the newest phones under the series are the Alcatel One Touch Idol, Alcatel One Touch Idol Ultra and Alcatel One Touch Idol X. The Alcatel One Touch Idol features a 4.7 inch IPS LCD capacitive touchscreen with 16 million colors. The display has a resolution of 540 x 960 pixels. The screen is Dragon Trail Glass and has an oleophobic coating. 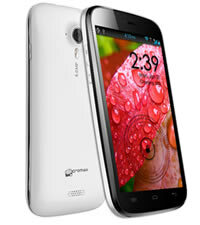 The phone is powered by a Dual-core 1 GHz MediaTek MTK 6577+ and a 512 MB of RAM. The phone has a 4GB internal storage and an expandable external storage up to 32GB. It also features an 8 MP primary camera with autofocus and LED Flash. The phone also has a 2 MP secondary front-facing camera. The Alcatel One Touch Idol is the official mobile partner for the third installment in Marvel’s Iron Man movie series. It will be featured in the movie Iron Man 3. Furthermore, the phone weights in just below 110g, which the company claims makes it the lightest smartphone in the market yet. However, to get this weight the company has had to use a lighter plastic which many say makes the phone feel cheap. Micromax is an Indian Mobile Company. As a mobile phone manufacturer in India, their phones have to be positioned as such in the local market. The India market is very price sensitive. Hence, in order to cater to this low cost demand, Micromax released the Canvas A116 HD, a quad-core HD smartphone in a mid-range category. The information for the detailed table about the two phones has been taken from the Alcatel One Touch website, the Micromax website and GSMArena.com.